Indulge in the elegant beauty of Chocolate by Petite Le Vian. 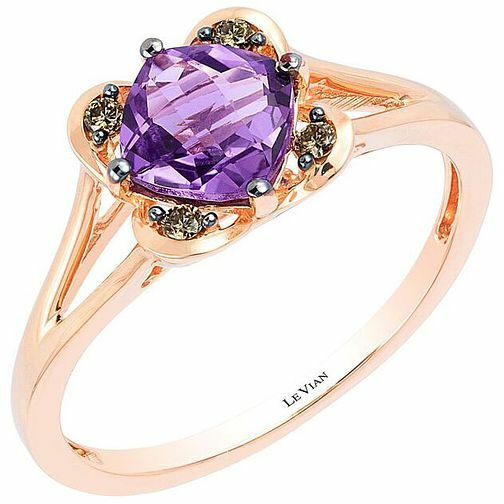 Showcasing the vivid violet hues of glistening amethyst, this elegant 14ct rose gold ring also features delicate chocolate diamonds for added sparkle. From ancient royalty to today's red carpet, Le Vian is the couture jeweller of choice. 14ct Strawberry Gold Amethyst & Diamond Ring is rated 5.0 out of 5 by 3. Rated 5 out of 5 by Anonymous from This ring is a perfect gift I brought this ring for my partner she absolutely loves it. It's very beautiful and i would very much recommend you buy one.